New studio album by the legendary Italian progressive rock band! 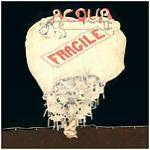 More information: A band new album by Italian Progressive Rock legends Acqua Fragile. Along with compatriots PFM (for whom Bernard Lanzetti’s stunning vocal prowess graced several classic albums), Acqua Fragile were true progressive rock pioneers in the 1970s. A New Chant features original members Piero Canavera, Franz Dondi and Bernardo Lanzetti, who have reunited after forty-four years to record brand new material. The album is also notable for the presence of some very special guests, including lyricists Pete Sinfield (whose lyrics have graced albums by King Crimson, ELP & PFM) and Nick Clabburn (who has penned lyrics for Steve Hackett & Squackett), along with acclaimed musicians Tango Spleen and Grammy Award winning drummer Jonathan Mover. The material on A New Chant is in the finest tradition of the 1970s albums by the band, and possesses a vitality that fits perfectly in the Progressive rock arena of the new millennium. A New Chant is the splendid result of one of the exciting reunions of recent times by one of Italy’s finest bands.